1. Power on your sound bar. 2. Press and hold on "+ -" buttons on the right of sound bar (not on remote) for 3-5 seconds to enter to remote IR Learing mode, the LED appears RED light blinking. 3.Using your TV/Cable remote point to sound bar, and press "Power" button, RED light stops blinking and press"Power" button again to confirm. 4. Press the Mute button, light goes to Gree , Press the Mute button again to confirm. 5. Press the Volume up button, lights goes to orange, press the Volume up button again to confirm. 6. Press the Volume down button, lights goes to blue, press the Volume down button again to confirm. Easy setup (even though you are a technophobe) and you could install it by yourself without any help. Also, you could use easily according to our manual. 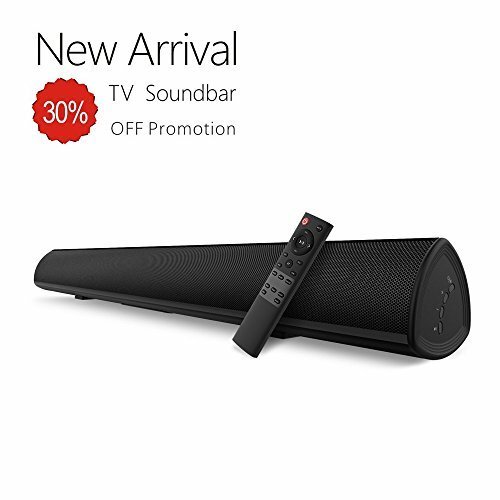 28 Inch Sound bar, nice size suitable for different size and any brand TV. Remote with Learning Function: You don't worry about using a lot of remote controls. You could use your TV/cable remote to control our sound bar, it is so convenient. More details about learning function, please check our user's manual kindly. DSP Technology: This technology let you have three choices for sound effects: news, movie and music, you can choose according to your current situation. Advanced Bluetooth Technology: Bluetooth 4.2 combines three specifications, including traditional Bluetooth technology, high-speed technology and low-energy technology. Memory Function and Bass Control: The update remote's reset button could be memorized to the factory settings. And you can control the treble and bass settings of the sound bar.